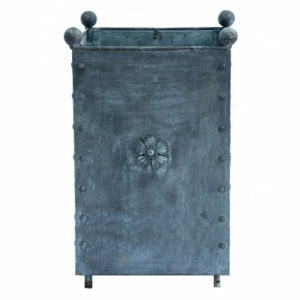 Our planters are made of heavy gauge galvanised steel, finished with a special treatment to give them an aged patina, and are decorated in a traditional Georgian style complete with Tudor roses and decorative balls. They have myriad uses in the garden, including as containers for topiary box balls, roses, small shrubs, trees and flowers. 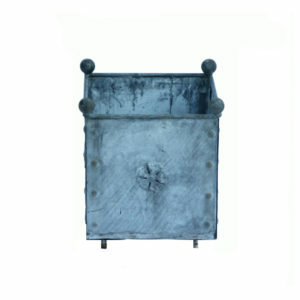 The planters are made from 1.5 mm galvanised steel. Their bottom panels are drilled to allow free drainage, and there are special 6cm feet in each corner to keep the base clear. 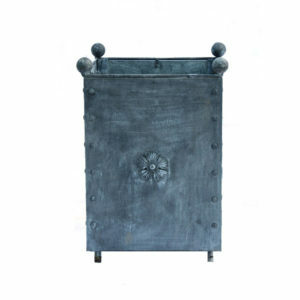 All the ornamentation is galvanised separately, and they also include galvanised coach bolts to hold them together. The decorative balls and Tudor roses, as well as the legs, are galvanised cast iron. 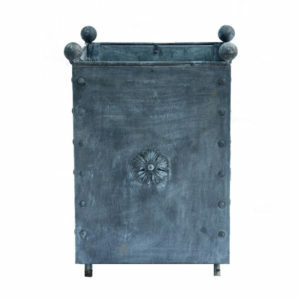 The hand-finishing process gives an aged patina that can be variable and will alter over time and location, meaning we cannot guarantee that the finish on all our planters will be identical. 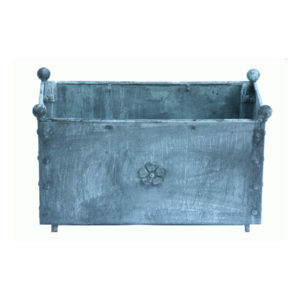 The planters are available in five different sizes. The following dimensions are approximate and are based on the actual size of the container, excluding the legs and ball decorations.